Many people ask our San Diego movers how to pack moving boxes so their belongings are well protected. Packing your belongings into the “right type” of moving boxes, and packing those moving boxes properly, is one of the most important actions that a person who is moving to protect your valuables. There are some basic concepts for how to pack moving boxes that if followed, will help protect your belongings from damage and will also save you money on your move. We hope this information is helpful to you. As a general rule of thumb, medium moving boxes such as the All Purpose Moving Box , are the most important moving boxes you can use for moving and storing. The reason is, smaller moving boxes are easier for movers to lift and move quickly, which saves you money on your move. These boxes can hold a lot of items, yet will not get too heavy. Bigger boxes should only be used with moving with large lightweight items like pillows. Pack Properly: Put your belongings into the smallest box it will fit into. If an item fits in small moving boxes then place your belongings in that. The reason is, with smaller boxes there is less of a chance for your belongings to have damage inside because there is less movement. This is very important with heavy items like books. 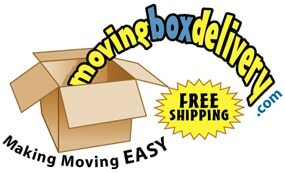 Only use a few different size boxes: Movers stack boxes in the moving truck and on dollies. If you have your belongings packed in boxes of the same size, then your movers will be able to stack more San Diego moving boxes on the dollies per trip, and also maximize space on the truck. Faster movers will save you money on the cost of your move. Fill in the gaps of your moving boxes with newspaper: Fill in all gaps that exist in your moving boxes before you tape them with crumpled newspaper. The goals is to have no movement inside of your moving boxes. Only Use Certified 32 ETC Moving Boxes: The ETC label on the bottom of the moving box means that these moving boxes were designed to be stacked and stored in a moving truck without collapsing. The “32” refers to the weight that it will support-32lbs and the seal for moving and storing lets you know that these boxes are designed to be stacked without crushing. Most boxes that you purchase at the local store are not designed for moving. Be sure to keep not more then 32 lbs of weight in each boxes. Tape all your boxes shut before the movers arrive: Local movers are paid by the hour. Therefore, the faster your movers are, the less expensive your move will be. The biggest thing that you can do to help your movers is to tape all of your moving boxes shut BEFORE your movers arrive and place all loose items around the house inside of moving boxes. Most people do not realize that movers can not transport loose items that are not inside of a box, or moving boxes that are OPEN. Open moving boxes can not be safely loaded and stacked on top of each other on a moving truck. Your move will require less time if you have placed all loose items inside of your moving boxes and all of your moving box are shut and ready to go!